DataBase (either central or local). The MOTIVE ToolBox is a dedicated tool for converting and uploading output data from various forest models to the MOTIVE ToolBox DataBase. Easy installation: the full package is installed by simply extracting a compressed folder (ZIP). All the necessary program files as well as the local database are part of the package. Viewing of the database content: The contents of the local database can be viewed (Figure 28). The client supports using multiple local databases, which enables database backups and data transfers by means of simply copying single database file. Scripting operations: the client acts as a script editor (including advanced features as syntax highlighting) and as the execution environment for scripts. Logging/debugging and error messages from the scripting engine are displayed. Upload to the central MOTIVE server. 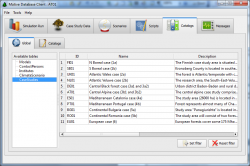 Content of a local database are uploaded to the central server or transferred to a local MOTIVE ToolBox installation directly from the client user interface. The MOTIVE MOTIVE Client manual contains additional documentation regarding the features and options for the client and is part of the client package. 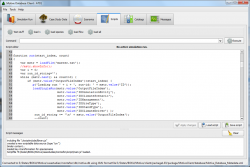 The MOTIVE Client is cross platform client application (Windows, Linux, Mac) for data processing. It is used to convert result data from forest simulators to the MOTIVE format. libraries and ini files. It does not require installation. Unzip the zip file anywhere to your computer (make sure to preserve file paths). Run the client by double-clicking the “MotiveClient.exe” file. See also the MOTIVE Client documentation.